I like to play with my food. For some reason, it makes me less hungry. When I got these little suckers from a vendor at work, I had no interest in eating them. But I did want to play with them. Maybe it’s a commentary on how much food we waste in America, or maybe it’s just because candy is pretty, Food Crafts are huge source of entertainment in my world. 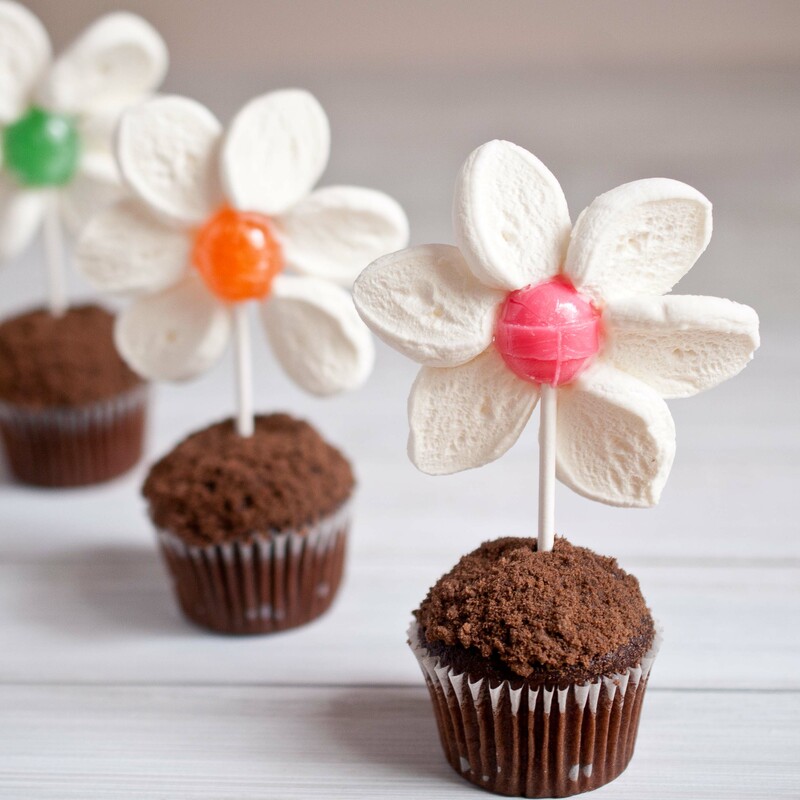 Although there are many cupcake toppers featured on websites across the land, I’m not a fan of inedible garnishes. Even if I don’t plan to eat it, it seems like you just didn’t try hard enough. Sure you can print out a pretty flower decal from your home computer, or make a rose out of paper, or a fancy embelishment with ribbons and buttons, but if you can’t eat it what the heck is it doing on my plate? No one glues plastic googly eyes to a pot roast. Or puts a wizzard hat on a chicken sandwich. 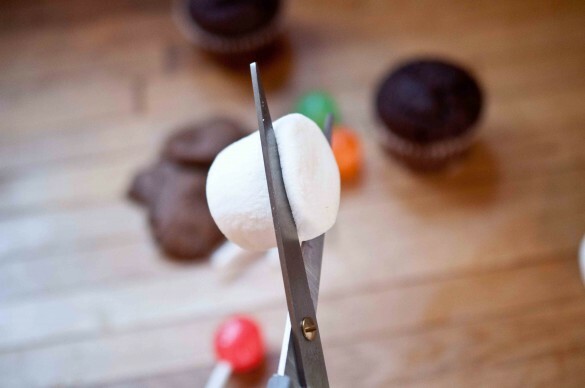 Why are completely random acts of craftiness allowed on baked goods? And paper flag banners on a cake? weird. Why not put a pile of mail on there, or decorative globe? 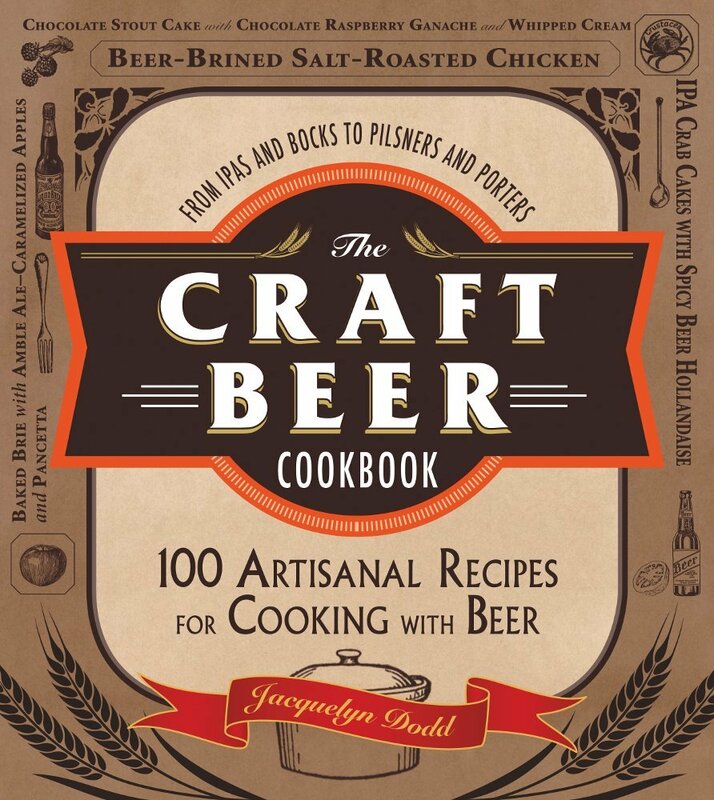 What’s next, filling my plate with bedazzled paper mache vegetables? 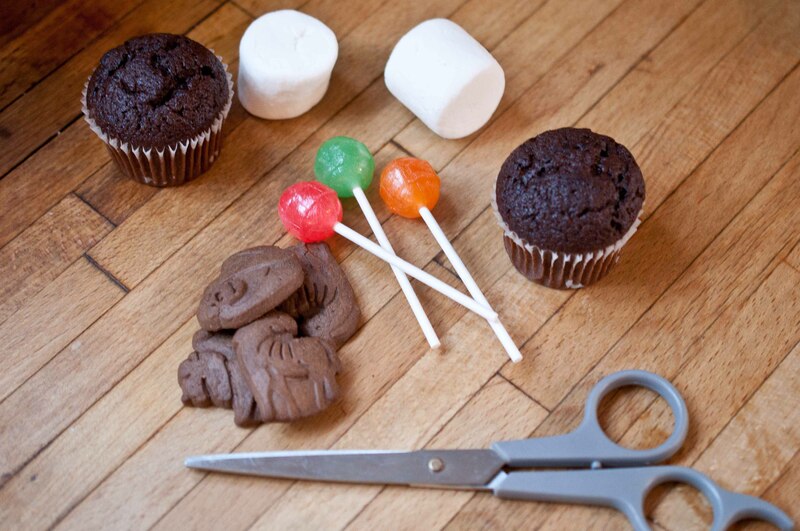 Here is my entry for completely edible cupcake garnish, other than the stick, of course. 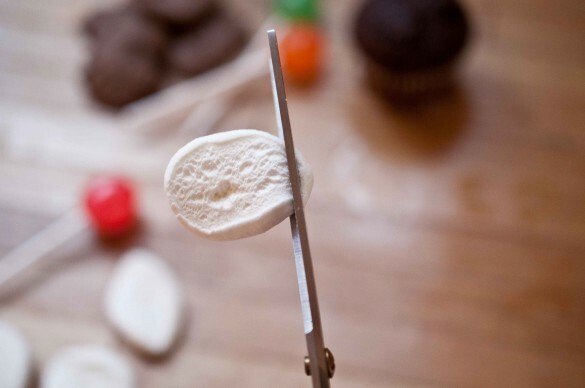 Cut the marshmallows into four to five slices. There are going to be a few that just don’t look right, so cut more than you need. They will curl up a bit, but just push them flat. There will most likely be one end that is a bit more rounded and one that is a bit pointier. Cut off a very small amount of the pointed end, about 1/8 of an inch. 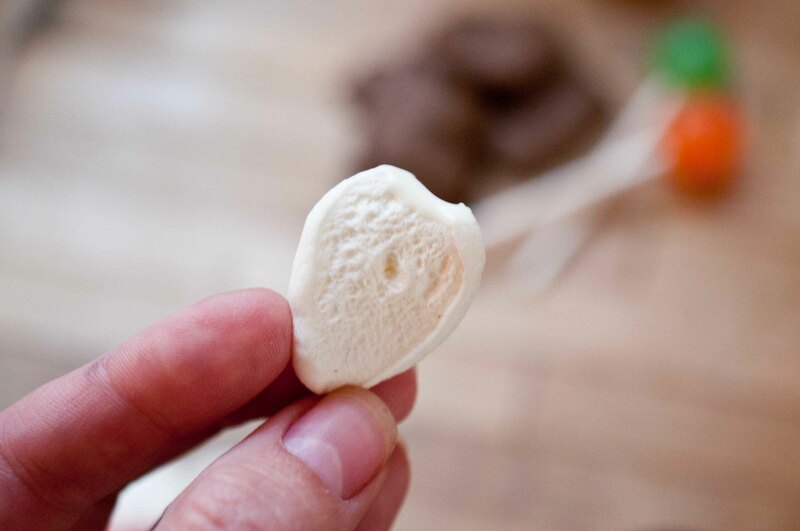 Place the white chocolate in a microwave safe bowl. Heat in the microwave on high for 20 seconds, stir and repeat until melted. Don’t over heat or it will seize. Using a butter knife or a spoon, smear a small on the marshmallow petal where you just made the cut. 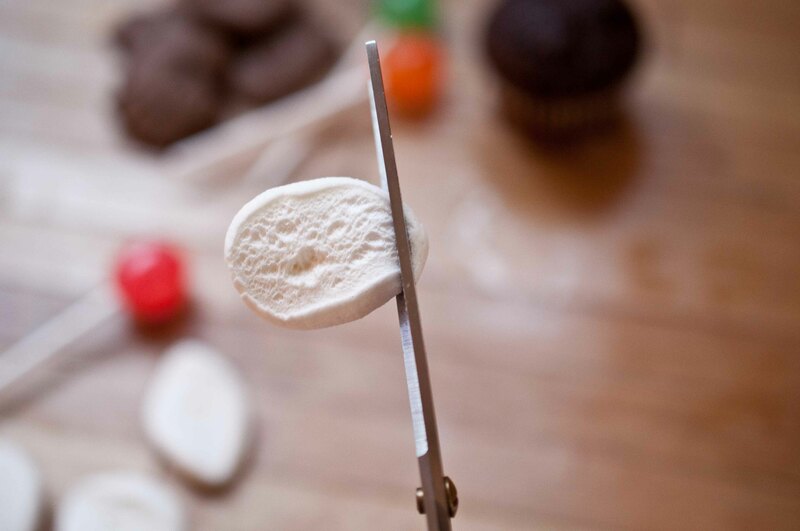 Press the chocolate side against the sucker, at the base, nearest the stick. Repeat for all pedals. You’ll want to put about 5 petals on each flower which will require a bit of overlapping of the pedals. 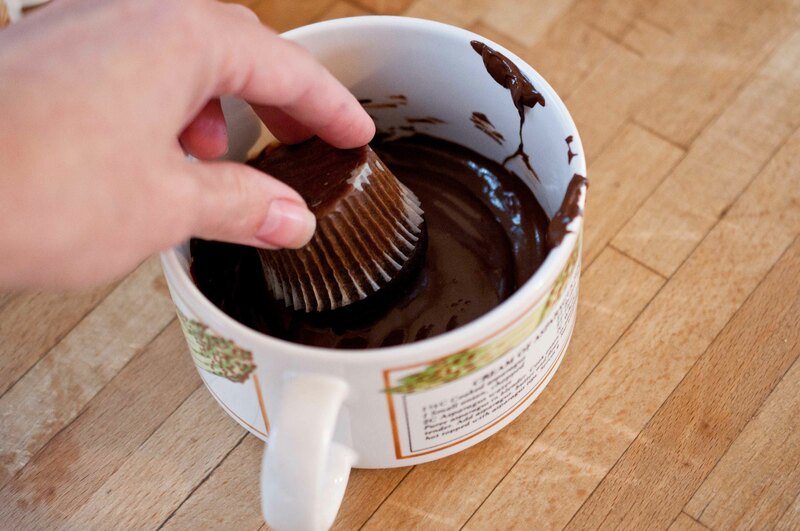 Lay flat until the chocolate glue dries. Put the chocolate chips in a microwave safe bowl and heat on high for 30 seconds, stir and repeat until melted. In a food processor, process the graham crackers until nothing is left but crumbs. 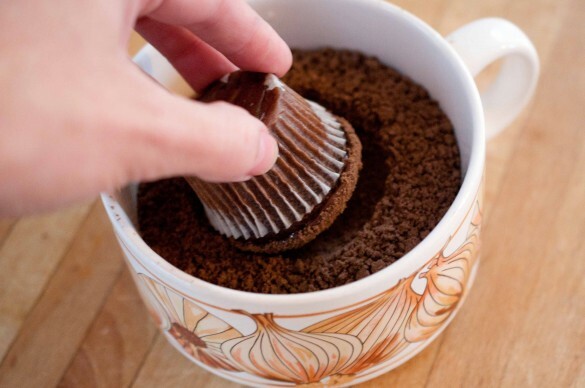 Transfer crumbs to a bowl. 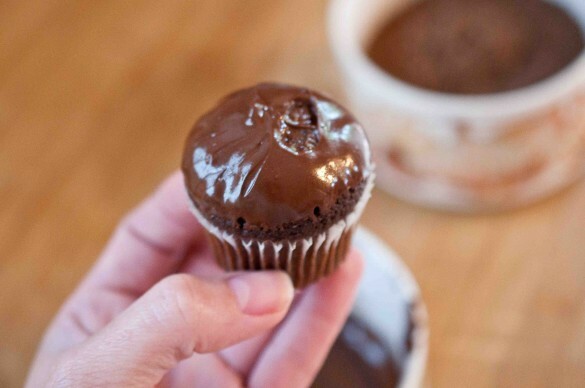 One at a time, take the mini muffin and submerge the top in the melted chocolate until completely coated. 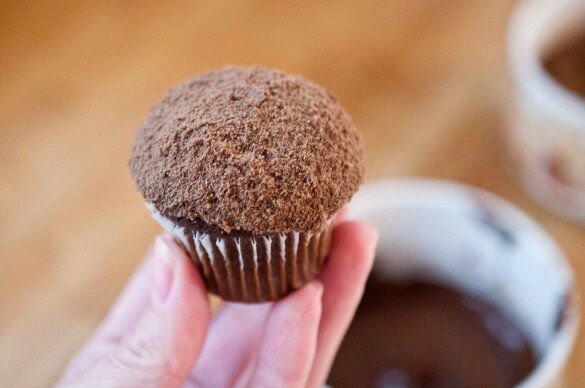 Before the chocolate cools and dries, roll the melted chocolate muffin top around in the graham cracker crumbs. Once all the chocolate has dried, plant your candy marshmallow flower in your little mini muffin pot. so cute! these would be perfect for easter. love ’em! THESE ARE THE CUTEST JACKIE!!!!!!!! Ah love. Yum-now this is the kind of gardening I really could enjoy! These are adorable, such a creative idea. Food crafting is a lot of fun too. 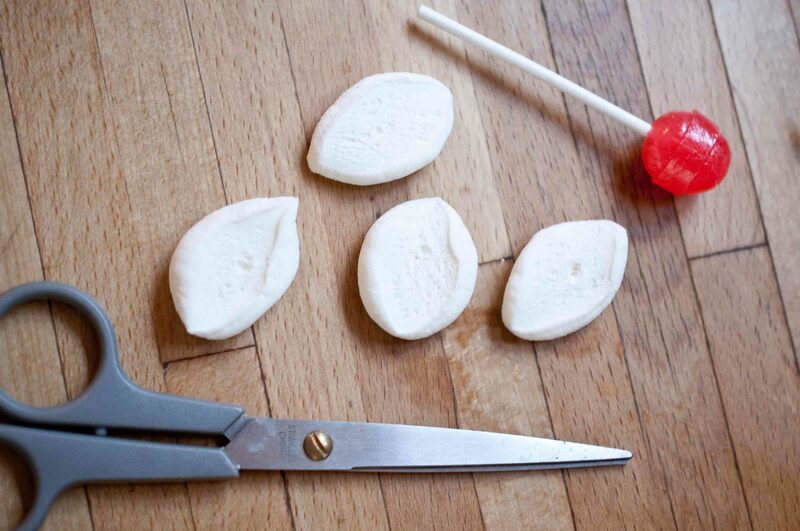 I would have never thought to cut marshmallows into shapes. Great post! I love these cupcakes!! What a darling idea! So beautiful and creative! I love them! I snort-laughed several times while reading this post. I’m with you on the dislike of inedible garnishes. Googly eyes on pot roasts and wizard hats on chickens…hilarious. I might have to quote you on that sometime. You made some clever flowers! You are just awesome! These are so adorable Jackie! Lovely idea that has been so well executed. For reals, playing with your food makes you less hungry? You’re lying. TELL ME YOU ARE lYING! Because that is sooooo me too! If I’m starving, I’d rather get in the kitchen and bake, or chop, or something, and then I’m not as hungry. WEIRD! Oh yes, and these cute little flower pots are well, real cute! Thank you, I’ve just been searching for an easter craft for all ages! thank you for a fabulous spring share!!! Wonderful mini-muffins thanks from Spain. Um, sorry, but your the weird one that doesn’t like paper flags on cup cakes. It doesn’t matter if the topper is edible, it’s all about cuteness regardless. 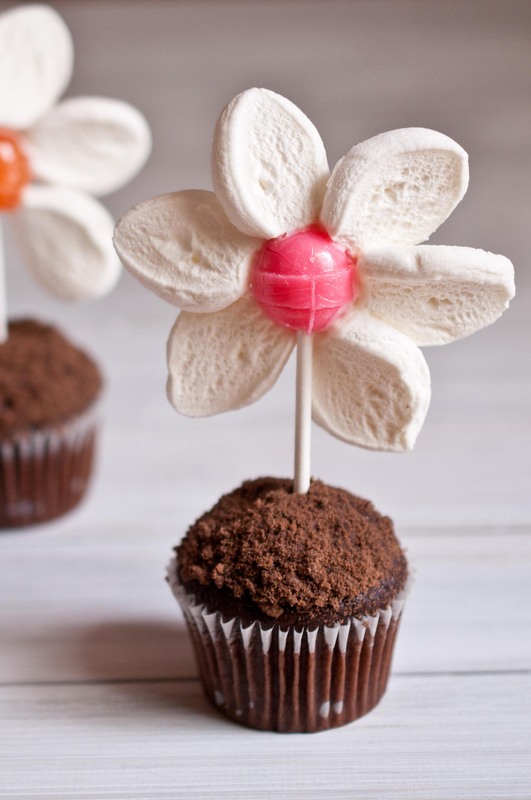 Don’t knock the cuteness factor, ever, when it comes to cupcakes. I mean edible ones are fabulous and a bonus, but don’t put down the amazing non edible toppers that people spend a lot of time making. Just had to say it. Your blog is great & opinions are great! I needed a snack idea for Juliette “Daisy” Low’s birthday, founder of Girl Scoutsfor our junior scout meeting tomorrow. Nth else are perfect! Thanks for the cute idea! Did this craft with my students. DO NOT MELT CHOCOLATE IN THE MICROWAVE!!!!! Within a few seconds the chips were on fire and the bowl had melted!!! Stank up the whole school building and the principal thought the building was on fire…. luckily he checked before pulling the fire alarm!!!!!!! 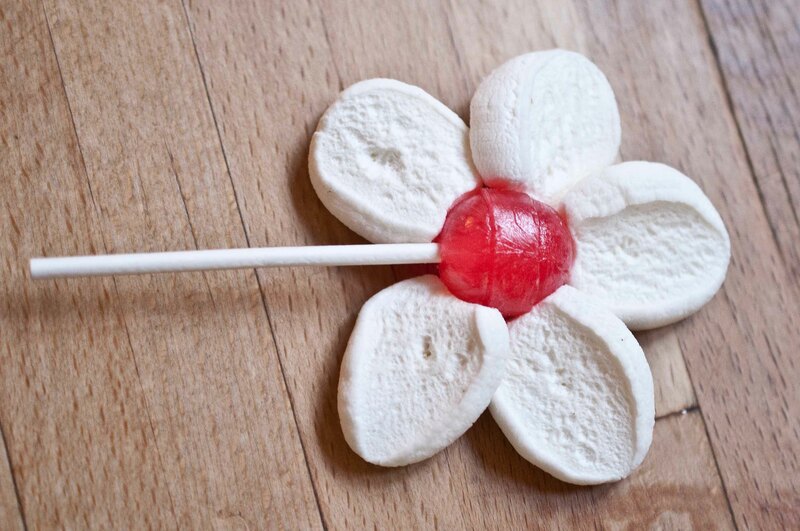 We were able to stick the marshmallows on the suckers without the chocolate. I’ve been melting chocolate in the microwave for over a decade, and nearly two dozen different microwaves. Never had a problem. Just stir it every 30 seconds and you’ll be fine. I imagine if you microwave it for several minutes you’ll have an issues. Also, there is no reason it should have caught fire, what else was in there with it? What bowl did you use?